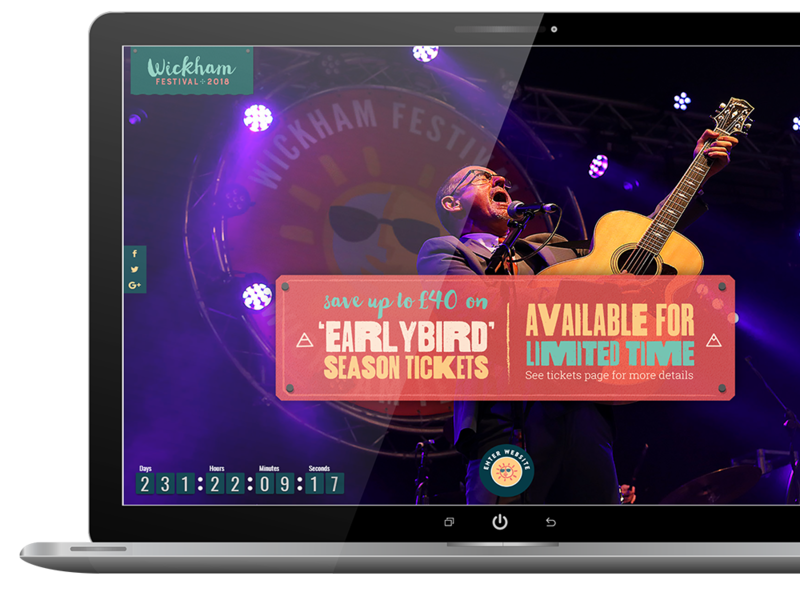 Wickham Festival is a 4-day music festival with four stages plus a host of other entertainment held in a stunningly beautiful rural location near the historic village of Wickham in Hampshire. 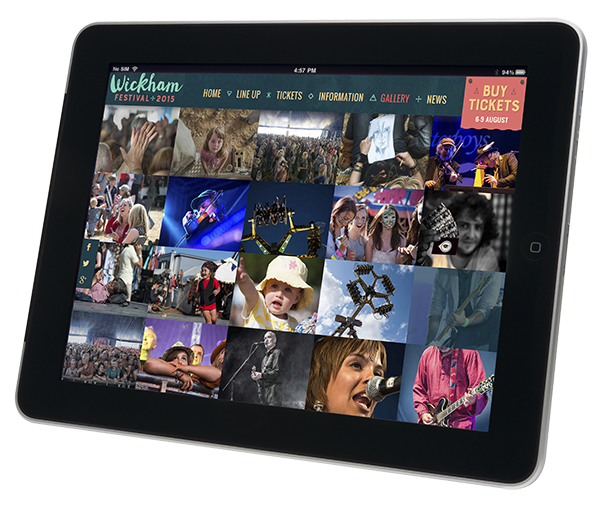 Wickham Festival is rated by many as one of the safest, most relaxed and family-friendly festivals in the UK. They were voted "Best UK Festival, capacity under 15000" at the Live UK Music Business Awards in October 2015. Having attended this event for several years now, this has become another project we’re immensely proud to work on. 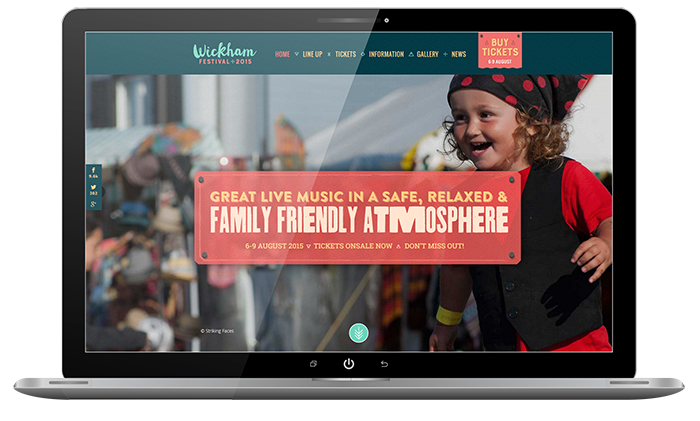 The team behind Wickham Festival are passionate about their event and it shows in the friendly vibe of their regular visitors. 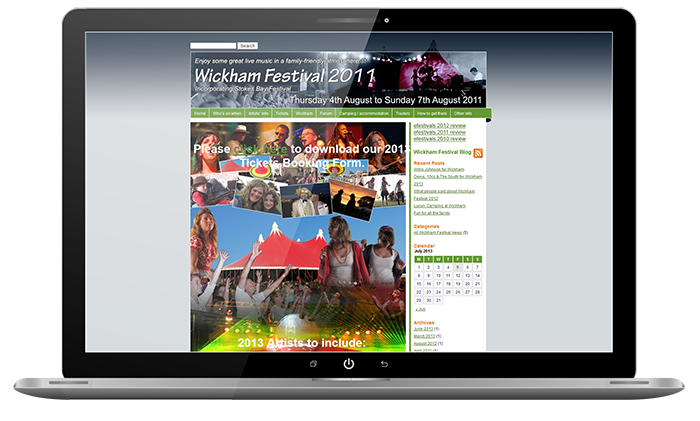 Wickham Festival has been taking place since 2006 and had various versions of it’s website since it started. These started off as flat HTML sites that required our developers to update and then progressed onto WordPress in time for their 2011 website. For their 2015 event they wanted a complete rebuild which included a brand refresh of their logo and other assets. A major reason for the rebuild was to make it responsive (mobile-friendly) as the current site was only designed for desktop users. We met with the Wickham Festival team on site (yes in a field) before spending lunch at the local pub. Apart from a chimney fire delaying lunch we had a productive afternoon agreeing roles, responsibilities and our general working practice. The budget was limited so a key aspect of the project scope was to build a site for 2015 and have a clear path for adding further content and functionality in the coming years. We worked together to devise the capacity for the task in hand with the goal being to document a site map with very basic wireframes and navigation structure. By and large this involved looking at similar festival websites, plotting features onto a spreadsheet, and then discussing what we thought worked and would be suitable for this build. 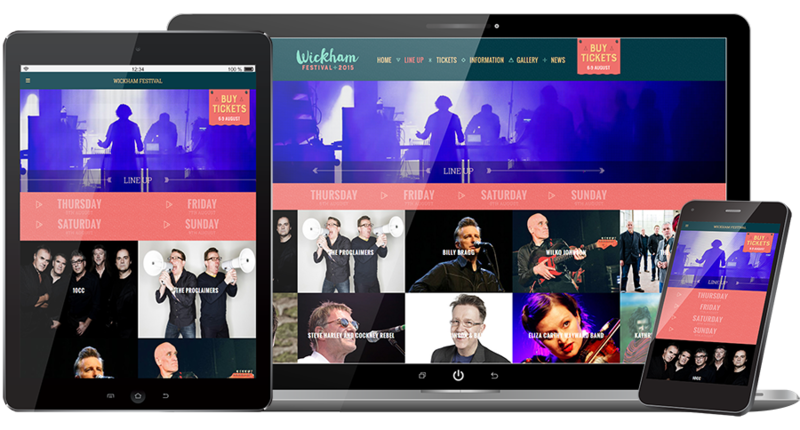 Much as we don’t know how to put on a festival, the Wickham team aren’t technical or design orientated in their experience. So the aim of our meeting was to make all the decisions face-to-face then and there … quite simply we’d crack on with the job after an enjoyable Sunday lunch and ale in picturesque Wickham village. The new site went live on 4th May 2015 in time for the festival later that year. As with the festival itself, we’ve built upon the initial site we developed back then and plan to keep moving it forward making adjustments as time and budget allows. During the 2017 festival the site had over 30K daily page views and provides a useful resource for visitors before and during the event. It also performs exceptionally well on search engines with just under 50% of traffic coming from organic search. It’s not often we get the freedom to just get on and build a site with an understanding of trust to benefit the project. Normally a brand refresh involves several stages of amendments but without the resources for this we set to work developing a brand and site with the sole purpose of delivering over and above what was expected. With the ever increasing use of social media we wanted this to play a key part throughout the website. The previous site had a forum which involved moderating and had generally become out-of-date with modern websites like this. We also wanted to introduce artist profiles so visitors could research bands from within the site. This included watching videos, listening to playlists, and following each bands’ social media activities across Facebook, Twitter, and Instagram. 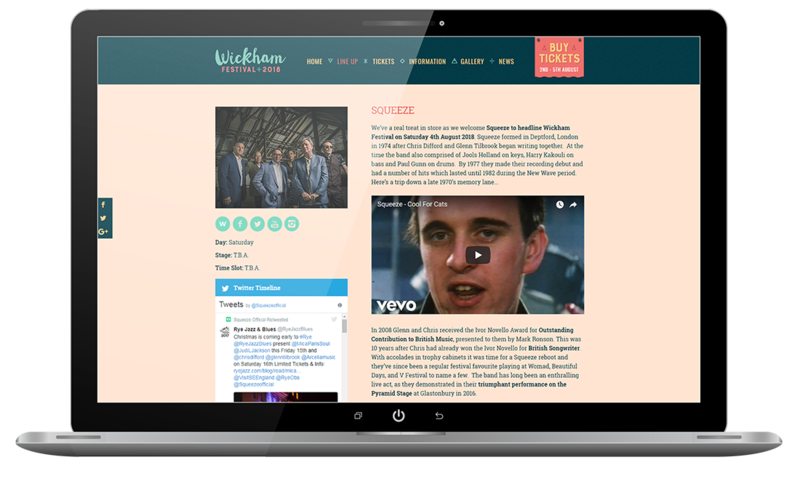 This was useful as Wickham is a strong supporter of the local community and local artists so we wanted to have a way to promote bands that some visitors might not have known before visiting the festival. As with all our case studies listed here, it doesn’t feel like you’re working when you enjoy developing their sites. 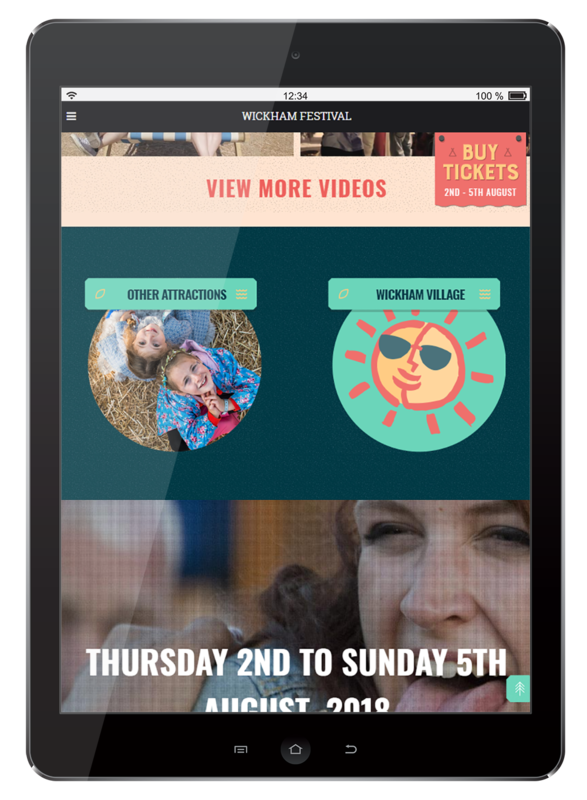 Wickham has seen attendances steadily increase with each festival being better than the last. We’re very keen to work further within this sector as we have a wealth of experience and knowledge to bring to the table. We’ve worked with the Intex Digital team since 2007 and have always been pleased with their contribution which has had a beneficial influence on our operation. The latest rebuild of the festival website has proven hugely successful. We have experienced a significant increase in website traffic, continue to receive fantastic feedback, and it has generally been a big asset to us and our workflow. We have been particularly impressed with the archiving system so we can easily update our next event immediately after the previous one (Sunday midnight) by updating a few fields in the administration area. Next year’s “Early Bird” tickets are already on sale as festival goers leave the event. All artists get archived yet remain under the same URL so we retain the search engine rankings for those pages. This has really helped increase traffic from organic searches which have now become our main acquisition channel. Any effort put into creating artist profiles is never lost and what’s best is that we generate traffic from artists who appeared several years ago. Another benefit is that when an artist returns we simply have to click a button and they’re then listed into the upcoming event. We have found Intex Digital to be technically proficient and personally easy to work with. They have a strong work ethic and complete tasks quickly with the highest quality. They’ve taken a genuine interest in providing consultancy to improve our online presence. In closing, I would strongly recommend their services and welcome the opportunity to continue working with them. We'd love to get involved with your event! Are you involved in live music events? We've refined a system full of tools & functionality.